Dioecious tree up to 50 m tall; not colonial; branches brown the first year, turning grey later; twigs smooth or sparsely hairy. Alternate, deciduous, simple, narrowly to broadly egg-shaped or lanceolate, 5-20 cm long, 3-12 cm wide, the bases tapered to heart-shaped or squared-off smooth, finely toothed and hairy on the margins, the teeth often tipped with a callous gland, lower side whitish or pale green and brownish; leaf stalks 2-10 cm long, often with a pair of glands near the blade; buds finely hairy with fringed scales. Borne in catkins; male catkins 2-3 (5) cm long, soon deciduous, with 8-60 stamens; female catkins 8-20 cm long. Capsules, broadly egg-shaped, carpels 2-3, smooth or hairy, nearly unstalked. Two subspecies occur in BC. The hybrids P. angustifolia James x P. balsamifera ssp. 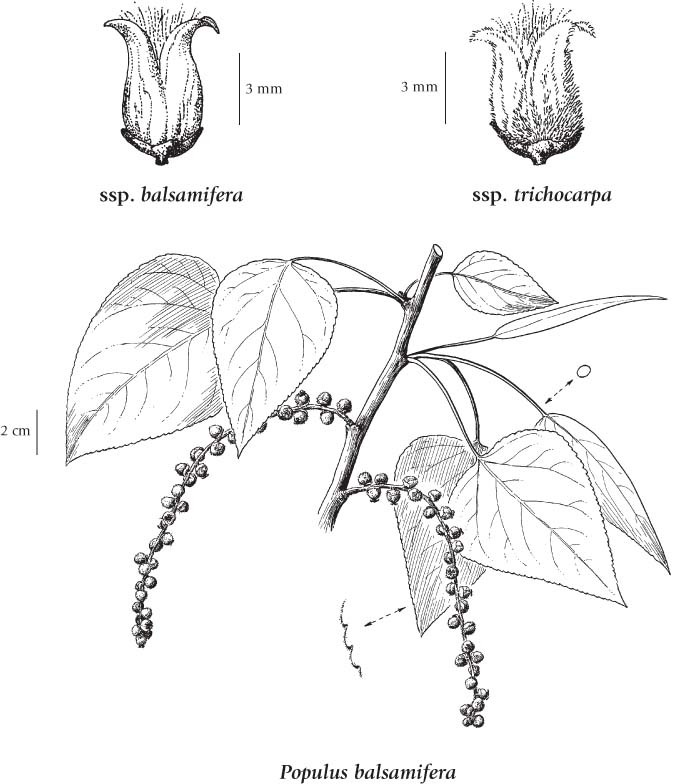 trichocarpa (P. x brayshawii Boivin) and P. balsamifera ssp. 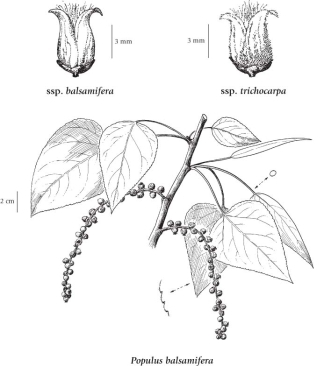 trichocarpa x P. nigra L. var. italica DuRoi are rare in BC . Moist uplands and floodplains in the montane zone; ssp. balsamifera - common in N and E BC; ssp. trichocarpa - common throughout BC except rare on Queen Charlotte Islands; ssp. balsamifera - N to YT, AK and NT, E to NF and S to NY, VA, IL, IA, CO, ID and OR; ssp. trichocarpa - N to S AK and YT, E to SW AB and S to ND, WY, UT, NV and CA. Populus balsamifera var. californica S. Wats. Populus trichocarpa Torr. & A. Gray ex Hook. Populus trichocarpa subsp. hastata (Dode) Dode p.p. Populus trichocarpa var. hastata (Dode) A. Henry p.p. Populus trichocarpa var. ingrata (Jeps.) Jeps.